Resort 2016 Camilla pump featured in the October 2015 issue of Harper’s Bazaar. Fall 2015 Mia clog featured in the October 2015 issue of More Magazine. 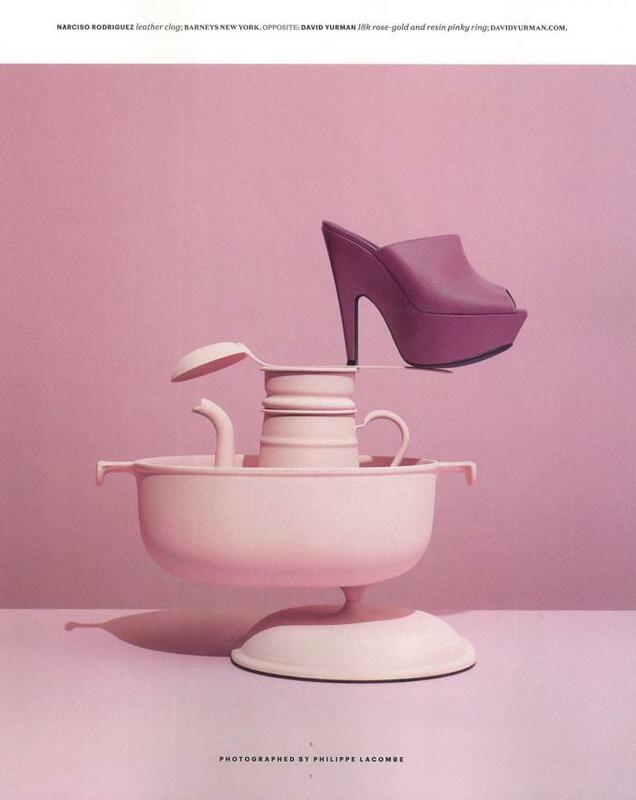 Colorful Narciso Rodriguez wedges featured in an all-pink look in the September 2015 issue of Harper's Bazaar. Narciso Rodriguez describes "The ELLE Look" with actress Claire Danes in the 30th anniversary (September 2015) issue of ELLE. Items seen in this feature include Look 34 and the mobius cuff from the Narciso Rodriguez Fall 2015 collection. The Narciso Rodriguez Fall/Winter 2015 orange nappa “Boomerang” clutch featured in this month's issue of SELF Magazine. Fall 2015 Looks 11 and 12, Boomerang clutch, and Mobius choker featured in ELLE Magazine's August issue. Jessica Alba carries her cayenne Narciso Rodriguez Claire bag in the latest Life & Style Magazine feature on vibrant totes. View the Barneys New York Narciso Rodriguez 'Clean Lines' feature and shop the Pre-Fall 2015 collection now on Barneys.com. The Narciso Rodriguez Gia clutch featured in the June 2015 issue of Self Magazine. The Narciso Rodriguez Fall 2015 blush wool pant and orange 'Mobius' cuff featured in the Harper's Bazaar June/July 2015 issue. The Gia Clutch featured in the February issue of Harper's Bazaar.